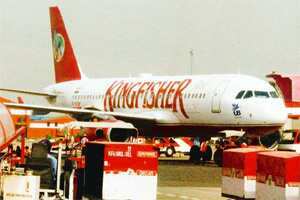 Kolkata: Liquor baron Vijay Mallya’s UB Group-promoted Kingfisher Airlines Ltd will have to bring in at least ₹ 400 crore more in equity from its other businesses to rescue the beleaguered carrier, according to Pratip Chaudhuri, chairman of State Bank of India (SBI). While ruling out any further conversion of debt into equity, Chaudhuri said lenders, at the instruction of the finance ministry, will meet Kingfisher’s management on Tuesday to review its financial woes. SBI is the biggest lender to Kingfisher. Its total exposure to the airline is around ₹ 1,500 crore, according to Chaudhuri. The firm’s total debt exceeds ₹ 7,000 crore even after a restructuring of capital in March, under which preference shares worth ₹ 750 crore were converted into equity capital, giving the lenders a 23.4% stake. Banks agreed to the conversion to reduce the airline’s interest burden, Chudhuri said. The conversion was done at ₹ 64.48 a share. Kingfisher’s shares closed at ₹ 19.65, a record low, on the Bombay Stock Exchange on Friday, amid concerns about the firm’s viability. Banks faced flak for agreeing to the ₹ 64.48 a share conversion price though it was determined in line with the pricing guidelines of markets regulator Securities and Exchange Board of India for such restructuring of capital. At that time, preference shares worth ₹ 648 crore held by the promoter group were also converted into equity capital at the same conversion price. Lenders have no plan to raise their equity interest in Kingfisher, Chaudhuri said. The UB Group must bring in ₹ 400 crore in the form of equity from its other businesses such as spirits which are “doing reasonably well", Chaudhuri said. The promoters had committed to bring in ₹ 800 crore, of which they have brought in only half so far, he added. A spokesperson for the UB Group wasn’t immediately available for comments. The group has been saying it doesn’t have enough cash immediately, and that more money could only come in if India’s policies for the aviation sector permitted foreign direct investment (FDI) in airlines. It isn’t possible under India’s current FDI norms, and the group must bring cash from its “other businesses", Chaudhuri said. The promoters of other airlines such as Jet Airways (India) Ltd and Air India Ltd have had to bring in equity to keep them afloat, Chaudhuri said, so it couldn’t be different for Kingfisher. For a rescue plan to work, all creditors to the beleaguered airline such as airport authorities and oil companies that supply jet fuel, and not just lenders, must “come on board", Chaudhuri said. Ahead of Tuesday’s meeting, lenders have asked the Kingfisher management to make a detailed statement on its fleet availability, airport landing charges and its ability to secure fuel.